Spring has sprung thankful – I hope your weather is as nice it is here in Boulder lately. In honor of Spring, please go and take a nice walk around the block. 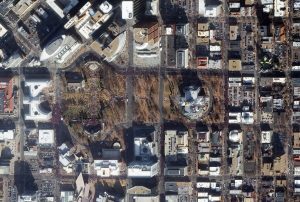 But before you head out on that work break, check out this color 50-centimeter WorldView-2 image collected over the 2018 Women’s March in Denver, Colorado. We covered the first edition of the Women’s March in Denver last year and were lucky enough to get another image this year! Approximately 50,000 showed up for the event that featured a much shorter but more crowded marching route. This data was collected on January 20, 2018 at approximately 10:54 am. This entry was posted in The Geospatial Times and tagged Colorado, Denver, featured products, The Geospatial Times, Your Imagery Work Break by Apollo Mapping. Bookmark the permalink.